It’s barely nine in the morning and the temperature already is close to 90 degrees, but that’s not stopping a dedicated group of volunteer gardeners at the National Library of Medicine. 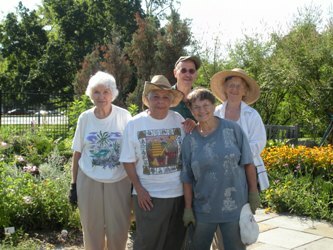 The volunteers, most of them in their 70s and 80s, come to the Library once a week to watch over an herb garden that recognizes the role nature plays in medicine. “It’s so peaceful, and we get to do what we love,” says Ida Wallenmeyer, who started her morning in the garden at 6:00, to beat the heat. 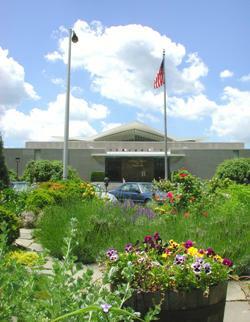 The garden was planted in 1976 as part of the bicentennial celebration on the campus of the National Institutes of Health (NIH) in Bethesda, Maryland. The original design and planting was handled by the NIH Grounds Maintenance and Landscaping section. Care and maintenance of the garden eventually was passed to the Potomac unit of the Herb Society of America. “Herbs are a pleasure to have in the garden,” says Susan McCall, who’s been volunteering since 1996, a short-timer compared to Wallenmeyer who started in the late 1970s. McCall explains that herbs can have a variety of uses—medicinal, culinary, and fragrance for example. When the NLM herb garden was started, 16 plants were chosen for their medicinal significance. Today, the garden is lush with roughly 100 varieties of medicinal herbs. Many of the volunteers are certified master gardeners who have gone through special training to provide horticultural help to their community. They come to NLM, usually five at a time, every Monday when the herbs are in season, which is typically from the end of March through October or November. The time is appreciated by people on the NIH campus. It’s not unusual to see employees or visitors relaxing at lunch on the wooden benches in the garden. Over the years, different NLM employees have taken a particularly active interest in the project. Judy Folkenberg in the Office of Communications and Public Liaison provides support for the volunteers. She handles logistical and administrative matters to keep the garden running smoothly and helps make sure plants get replaced when they die. “I myself have a passion for gardening,” she says. The volunteers say there’s a lot of personal reward for them, which can explain why they happily toil in the garden during a summer of record heat in the Washington metro area. 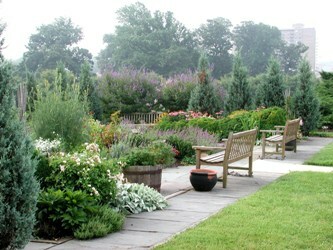 They enjoy the garden, and each other, and socialize outside of their time on the NIH campus. Photo Caption: Top and bottom photos courtesy of Fran Sandridge. Photo Caption: Middle photo, pictured from left to right: Ida Wallenmeyer, Susan McCall, Marty Isaacson, Marjorie Clark, Ermona McGoodwin. Not pictured: Joan Burka, Ann Schramm. Photo by Josh Williams.